Knee-length ivory gown with a tulle skirt and fully boned satin bodice. This adorable knee-length ivory gown has a tulle skirt and fully boned satin bodice with built in bust support. 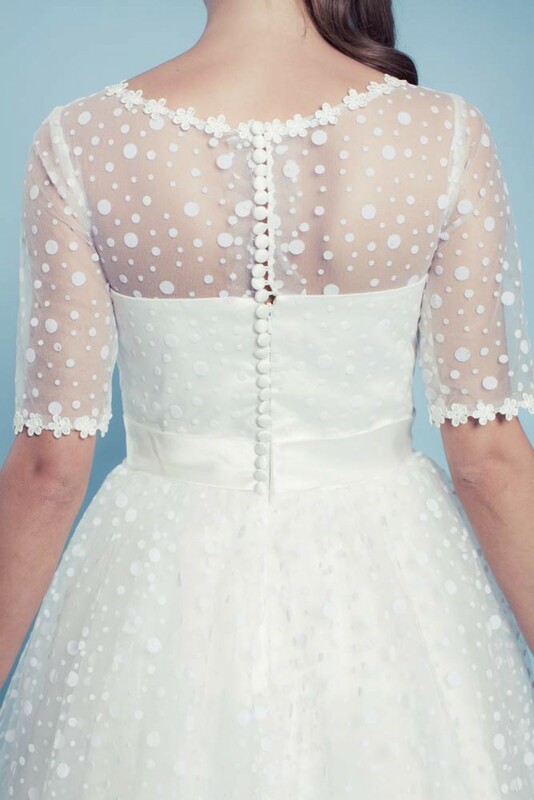 The polka dot overlay has a delicate flower trim around the neck and arms together with a satin bow on the waist. The back details satin buttons and zip. Stunningly pretty and guaranteed to induce total 'groom swoon'. Dress length: 41.5 inches (from top of shoulder and over bust to hem). Please note our model is 5ft 9 inches and is wearing a size 10 gown.